A black and white negative of a portrait of Elizabeth (Strickland) Smith. Brian Winter took a photograph of the original portrait that is held in a private collection. Mrs. Elizabeth (Strickland) Smith was born at England, on June 30, 1841, a daughter of John Strickland who lived in Oshawa. She married John Lawrence Smith, a Whitby Township farmer, on December 31, 1867, and died on the Smith farm at Corbett's Point, lot 21, Broken Front Concession, Whitby Township, on March 18, 1913. She is buried in Union Cemetery, Oshawa. 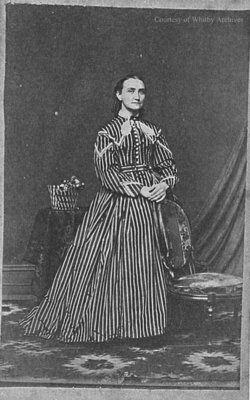 Elizabeth (Strickland) Smith, c.1870, Photographer Unknown. Whitby Archives A2014_005_004A.